That’s where we’ve been for the last two days. 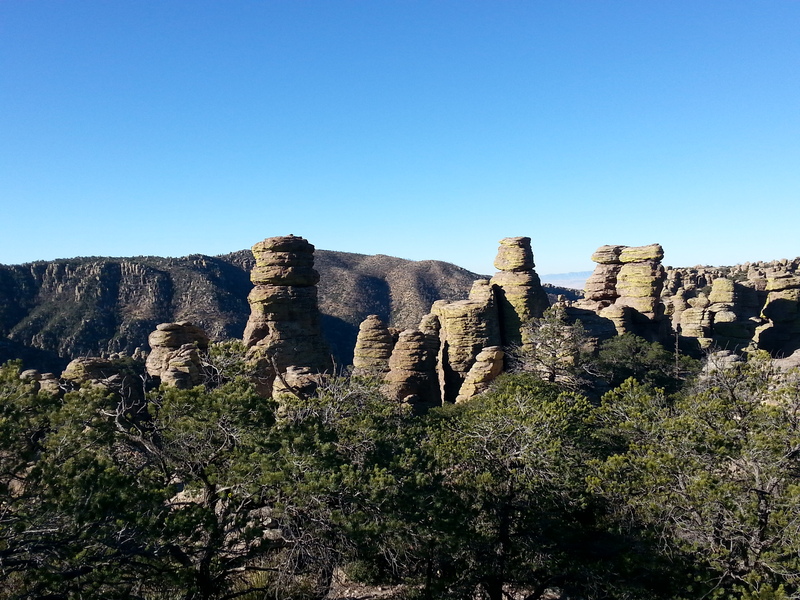 Chiricahua National Monument, Arizona. We’ve hiked here before, but not camped. What a terrific experience. You have probably figured out by now that we like quiet, rustic campgrounds. This was right up our alley. Only thing missing was the ability to have a campfire, which has been a common theme in our three weeks on the road. 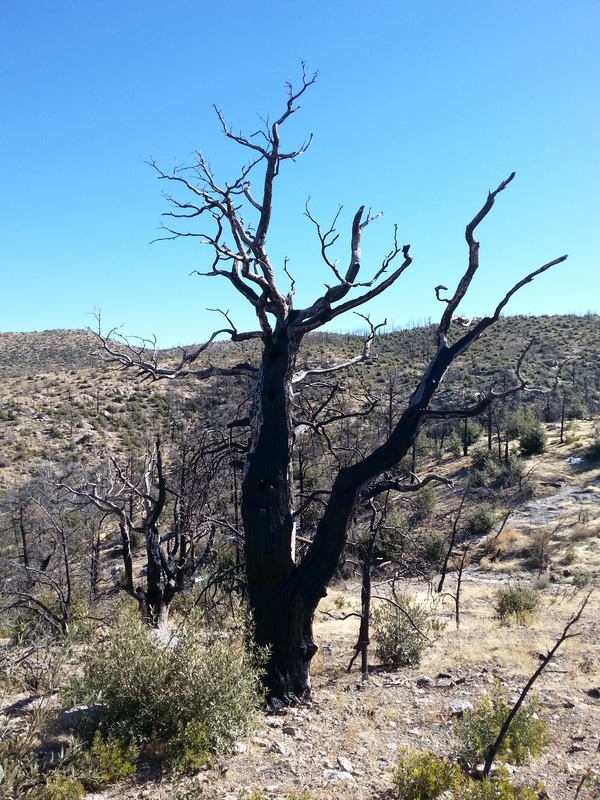 Extreme fire danger has eliminated this from most of the campgrounds we’ve visited so far. Our Senior Pass let us camp here for $6/night. Tough to beat, no matter what kind of amenities you might seek. We chose to dive in frontwards instead of backing in, so that we could line up our door with the picnic table, and also to keep Jezzy from looking out onto the road too easily, as we knew she would be solo in the Fireball for most of the next day while we hiked. This plan worked out well. 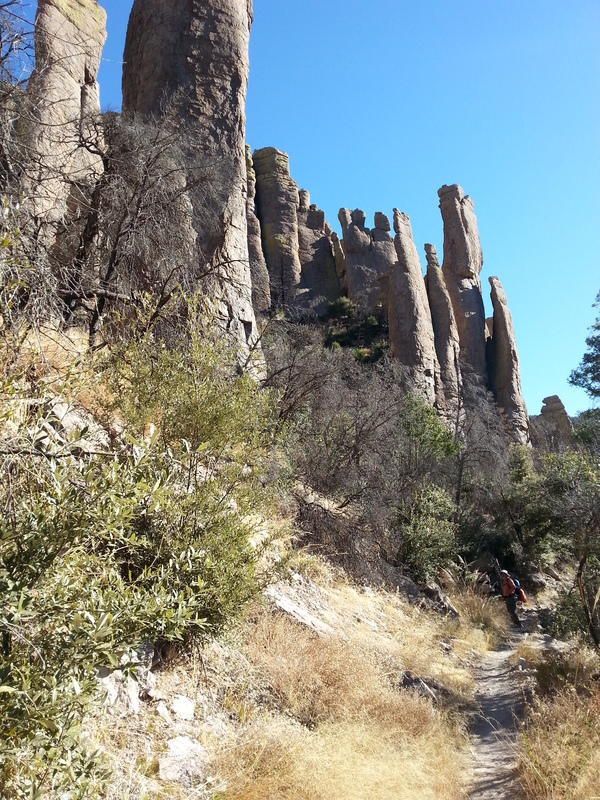 The crazy spires of the Chiricahuas were formed by ash from the Turkey Creek Volcano millions of years ago (probably the same volcano responsible for City of Rocks SP, but I don’t know that for a fact). 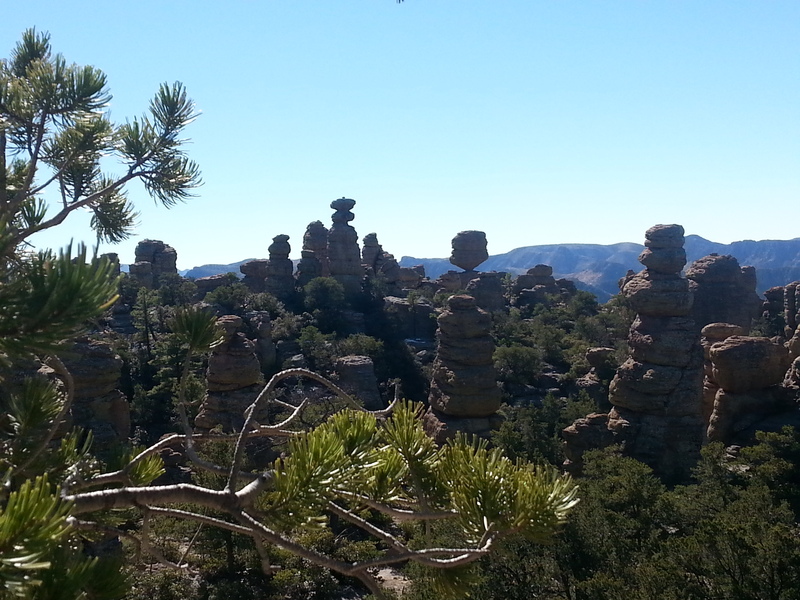 Wind and weather have formed hundreds of spires, pinnacles, and balanced rocks. Many have names, and we named many of our own. 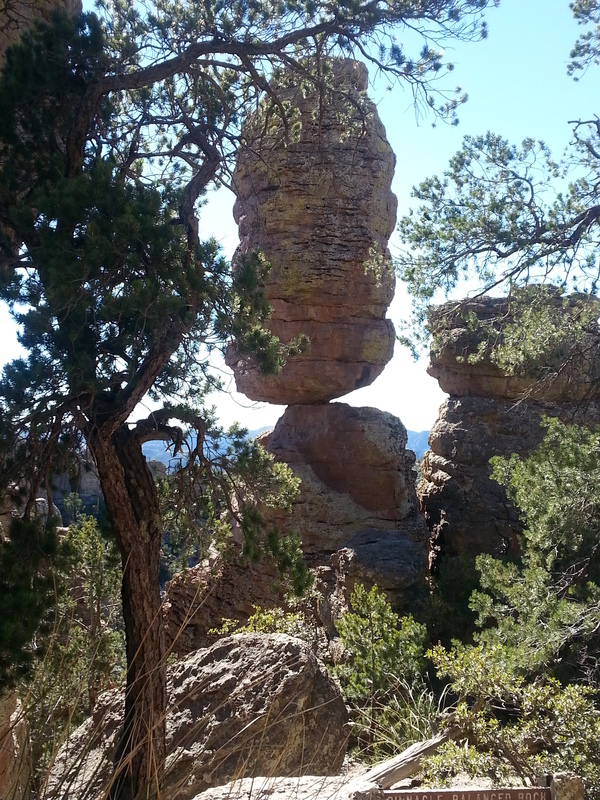 This one is Kissing Rock (not our name). As many of the other State and National Parks we’ve visited, we see the hand of the CCC in its creation. Trails were created, retaining walls erected, and signs posted that still do their job today. Perhaps Dan Quayle’s father was in the CCC. It’s hard to visit any of these magnificent public parks without wising that we had a modern CCC today – the legacy of this program will be felt for decades to come. From where will our new parks and public works emerge? It’s difficult and painful to contemplate. 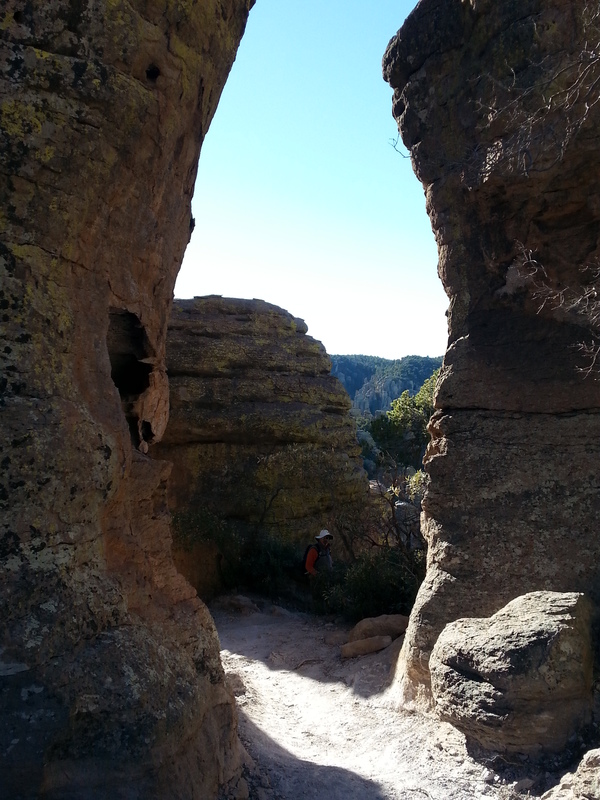 Chiricahua National Monument is an amazing place to hike, and we hiked til we could barely move one foot in front of the other anymore. Lucky for us, the Park does make it easy to maximize a good hiking effort. 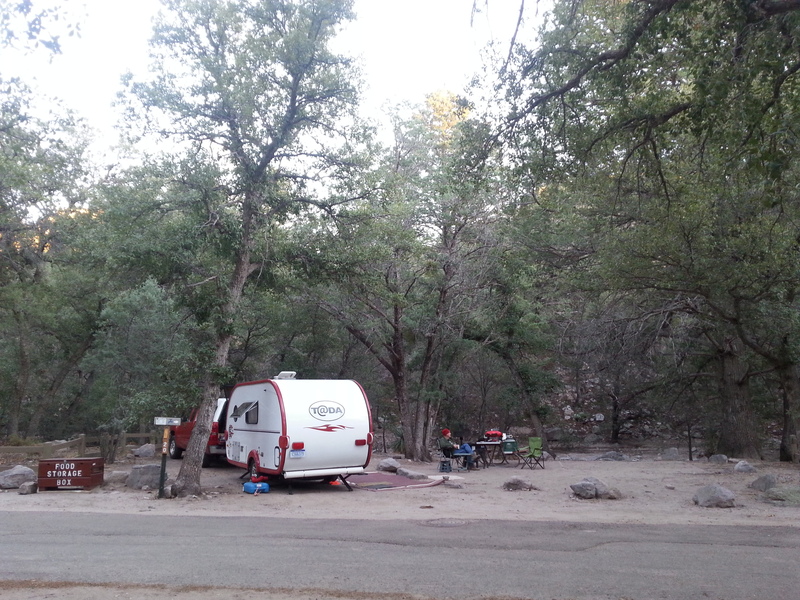 The Bonita Springs Campground (our camp) is located near the base of the Canyon, about 1/3 mile from the Visitor’s Center. We were able to hop the morning shuttle, which picked us up along with four other campers, right at the campground. The shuttle takes youall the way to Echo Canyon, at the top of the Canyon. From there, you can then take a fairly easy meander down through the spires back to the Visitor’s Center. It’s 4.7 miles. Or, you can hike every blasted trail up there – winding up & down, back & forth, until you’ve reached the VC. Then, you can walk back to the Campground. Guess which we did? 10.25 miles. 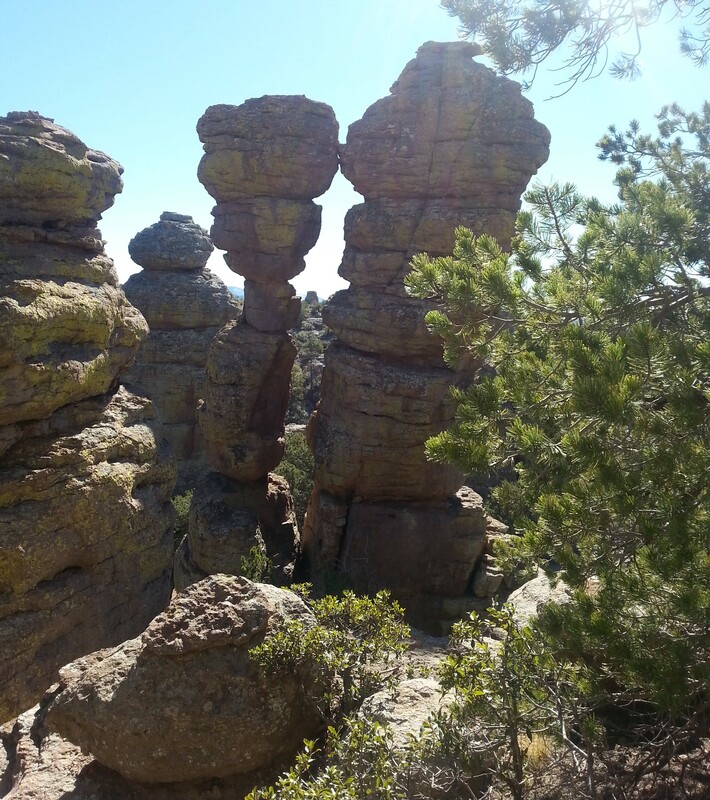 Wandering between and around amazing rocks, balancing in unbelievable formations. It was an unforgettable day – once again we felt like we were the only visitors in this fabulous park, passing only four other hikers (going up, when we were going down) all day. We were well prepared for the day’s hike, with plenty of water, sandwiches and snacks. A map. Enjoy the rest of the photos, not necessarily in the order in which we saw the sights. The Southwest is so very different than Michigan. We feel very fortunate to be able to visit these unique places. We’re also very grateful for the wisdom of Federal and State governments who have seen fit to protect these lands for enjoyment by the public for generations. It’s a great journey. 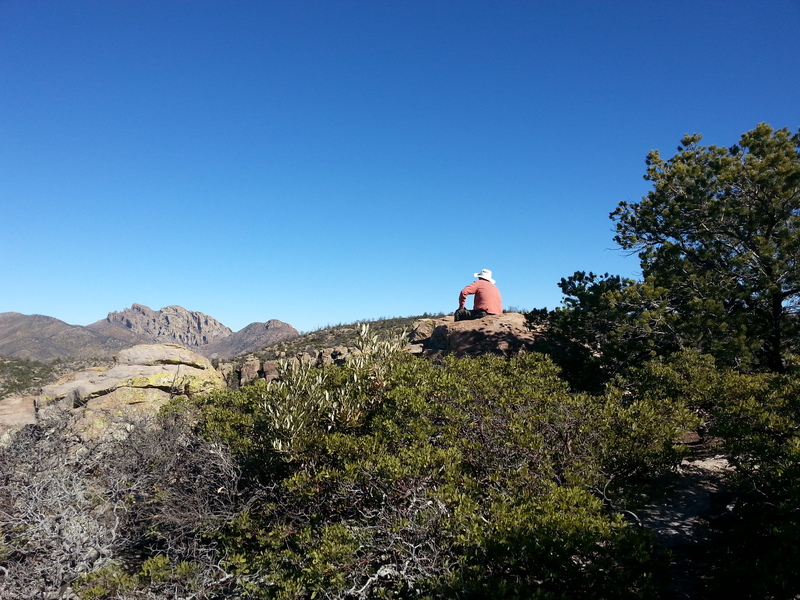 This entry was posted in Arizona, camping, great outdoors, hiking, national parks, retirement, simple camping, T@DA and tagged Arizona, camping, hiking, historic sites, national parks, retirement, road trip, simple camping, T@DA, the great outdoors by Judy Crankshaw. Bookmark the permalink. It took a couple of seconds for your “Grottoes” caption to sink in, but when it did, it was hilarious. Judy, I honestly don’t have a comment about the photos. They are simply too overwhelmingly powerful. Thanks for your comments. 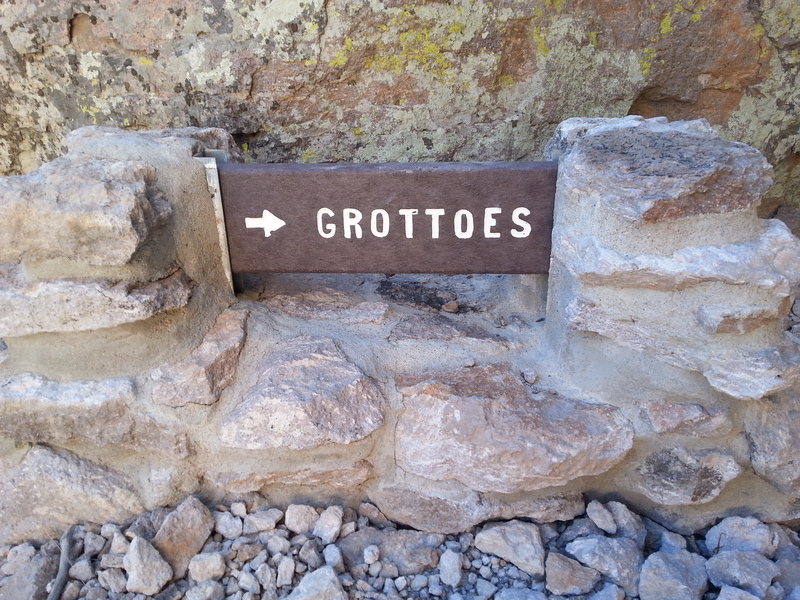 When we saw the Grottoes sign, we both thought of Quayle, altough it took us a few tries to come up with his name! WOW! Those scenes fill me with awe. So glad you are sharing them with us. So wish we had the CCC today. If we spent more on our parks and infrastructure we could put so many people to work and save our gorgeous parks for our descendants to enjoy. It’s funny about the CCC. We had this discussion on the shuttle up to the top of the hike. One couple from Texas, driver from Alaska, a couple from New Mexico, and us. We all agreed that a CCC-like program would be so beneficial these days. Too bad that our stimulus dollars didn’t stretch into creating actual jobs of this type, isn’t it? So much of the Southwest is awe-inspiring. There’s just such variety here – hard to imagine if you don’t get out of Michigan or the Midwest much. Amazing pictures and a great campground. I wish we could stay in parks like that, but Patty would have no tolerance for such places. I guess it’s because we are really ‘campers’, not ‘RVers’. They are two different breeds. Shuttle only goes one way – up in the morning. 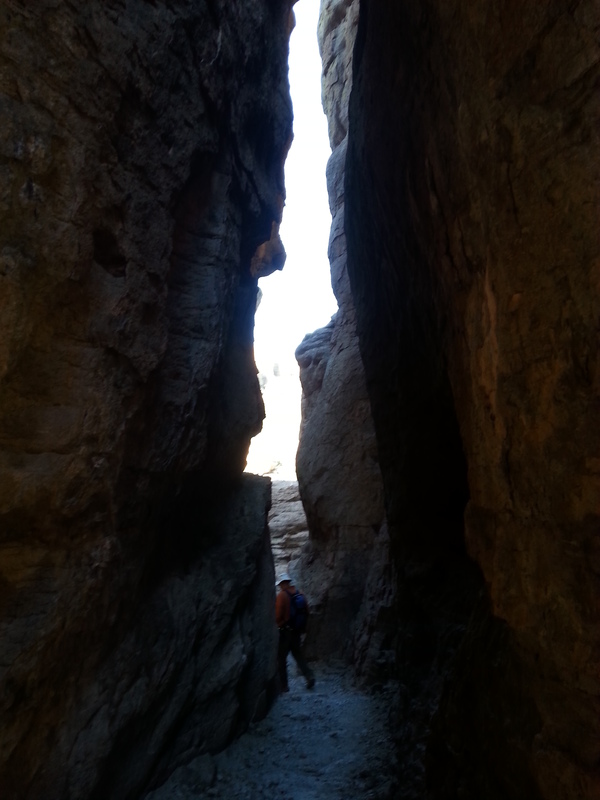 Or, you could drive up to the drop-off point at Echo Canyon, and walk thru the grotto, then back to your car. The grotto area is the one with the very tall rocks, and John wandering inbetween them. 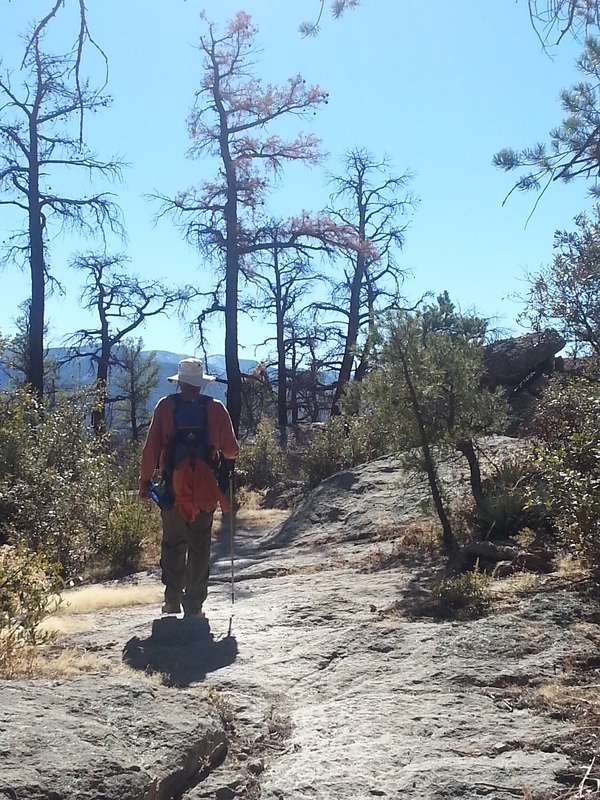 The 4.7 mile trail isn’t steep, but parts are rocky, leading for a few tricky footfalls. The area around the grotto is smooth, and pretty easy walking. You could easily go back and forth if you drove yourself, and there are some terrific views to be had from the road. 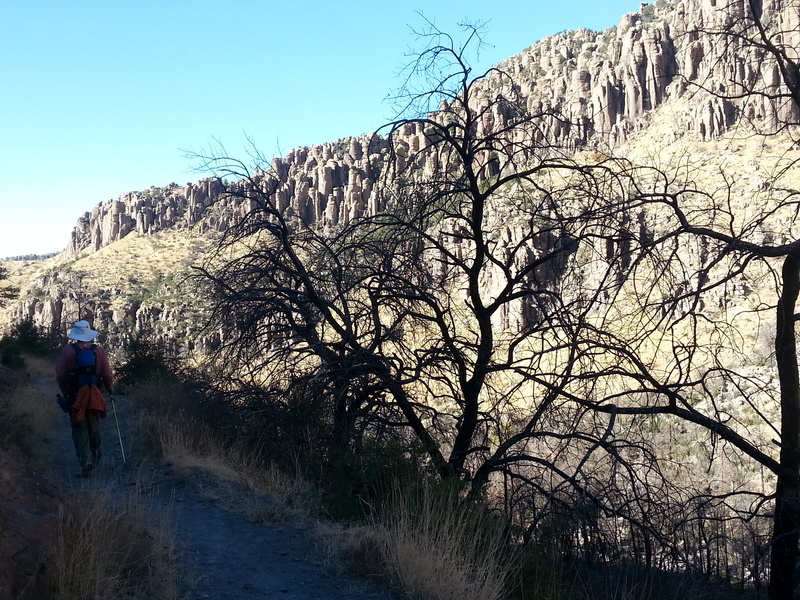 Up past the trailhead at Echo Canyon is an area called Massai Point. There’s a short nature trail up there, and exhibits as well. The trouble you will have is that your RV is too big for the campground – max 29 feet. You can’t even drive it up to the top – would have to unhook and use your car. There are a few “RV parks” in the area, none partiularly attractive, but worth it to get in a day there. It’s worth a try. Nowhere else like it. What wonderful morning reading with my cup of Joe. 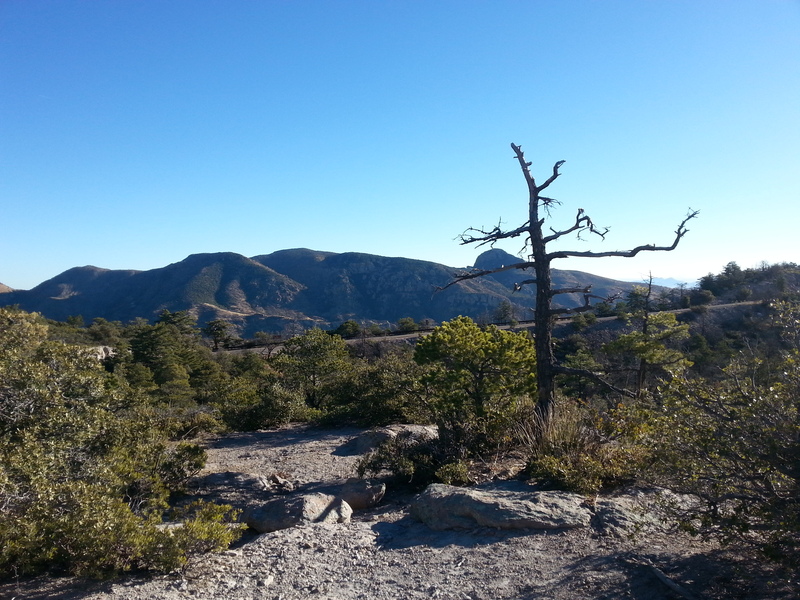 Over ten miles…one of those places the trail was never meant to end…envious of such beauty. Great plan for Jezzy…I should have been there to babysit :) May everyone rally to save our enviorment, especially such beautuful parks dotting America. We do take Jezzy when we can, but in the National Parks, dogs generally are not allowed on the trails. You can dogsit whenever you want – swing on by. Hope you make it this way next year. Thanks for sharing Judy! Amazing! Thanks for checking in, Mary Beth. You’ll not be surprised to know that we stuff our packs with caffeinated things when hiking – a thermos of dark-roast coffee, and Starbucks double-shots for each of us. We’ve had a great time so far. 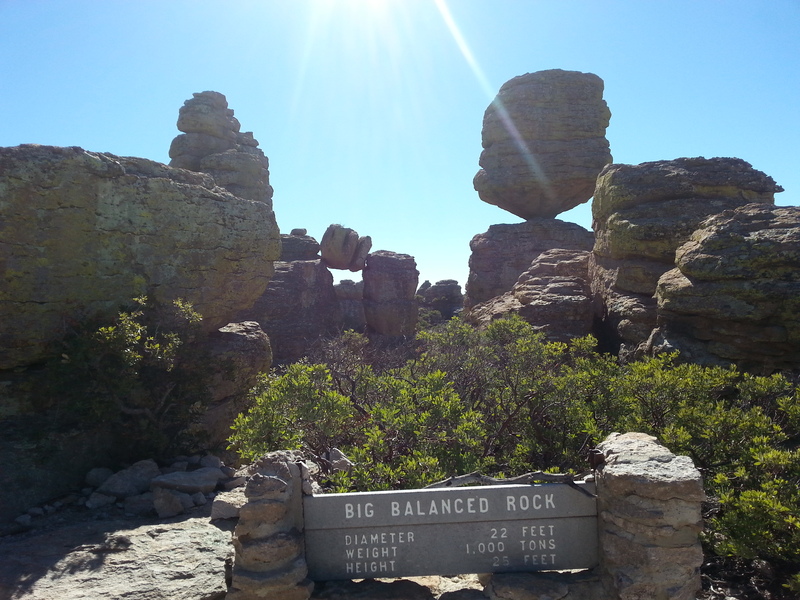 Between the wind and the earthquakes, it’s hard to believe that the rocks stay balanced as they are. It’s such crazy scenery – really a wonderful place to wander about.